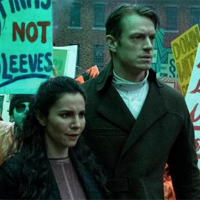 Showing 1 - 9 of 9 articles tagged "Altered Carbon"
They'll reprise their respective roles as Quell and Poe, Netflix revealed in a "cast announcement" teaser. Mackie will succeed Joel Kinnaman in the role of Takeshi Kovacs. Dropping the weight in a short amount of time was "the hardest thing about the show," he says. Did Netflix’s surprise release of The Cloverfield Paradox overshadow Altered Carbon? “There’s only room for one big streaming release in the average media cycle,” says Alex McLevy.